If your a DIY/Crafting Blogger or even a Recipe Blogger - boy, do I have something awesome in store for you!! I received the wonderful opportunity to be one of the first people to try out a new program that allows bloggers to make a Kit full of all the supplies needed for a selected project or recipe. What's the name of this magical program?? MystiKit!! Even the name sounds magical, doesn't it? When making a MystiKit, the process is really simple! All you do is add the Project/Recipe Information along with photos and a link to your project post. Then it's time to start adding the Materials and Tools! Mystikit uses Amazon to fill the kits and you get to chose which item you would like to add. You get the choice to make the supplies Required or Optional! One of the best parts is when someone purchases one of your kits, you get a commission! 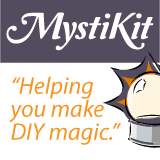 MystiKit truly is the "Next Big Thing" for DIY/Crafting Bloggers as well as Recipe Bloggers! If Amazon sales it, then you can add it to your Mysitkit! I have truly fallen in-love with making MystiKits! The uses are endless so I'm able to create kits for my DIY Remedy post as well as my Craft posts! New and Old! Being able to make the supplies to my projects available at a single click is a wonderful idea for both bloggers and our readers! No more rushing out to 1 or more stores trying to find the remaining supplies that you don't have on hand at home, to make that cool project you found on Pinterest or your favorite blog! I have a good little collection of MystiKits from My Kind Of Introduction, available already! Check them out if you like! Once you get to the page of kits, Click the photo of the project your interested in. The whole Kit and all of the information you'll need - will appear before your eyes! I LOVE IT! My latest MystiKit is for my DIY Heart Crayons post from this past March! MysitKit is not yet available to the full public. To become a kitter on MystiKit you must be invited or you can request to join. If your interested in become a kitter or would like to learn more about MystiKit, Comment below and I will get the needed information to you asap - Or you can fill out the MystiKit request form below. Fill out the Mystikit Request Form to see if you have the stuff to become a kitter or Comment below! I would love to hear more. Excited!